More than 300 children attended camps sponsored by the community’s Action and Mission divisions this summer. The camps took place in three locations: Shreveport’s Allendale neighborhood, the South Side of Indianapolis, and for the first time, in Evansville, Indiana. The Evansville camp was a three-week affair that the staff hoped would draw 20 or 30 children from the area. But on the first day, 38 children arrived, and by the end of the three weeks a total of 106 children had attended the camp. Jo Zimmel, a retired physical education teacher from Servant Branch, led the effort, training staff members and planning activities, which included launching bottle rockets and making foam with “Mr. Science,” Jo’s husband, John, a chemist. 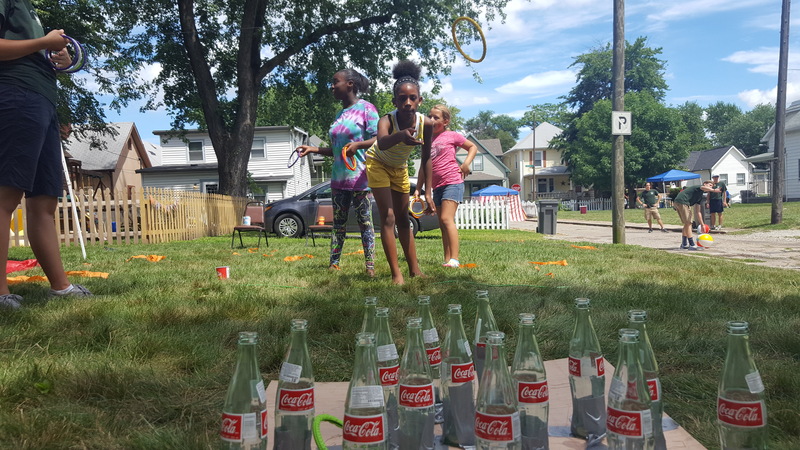 Evan Lent, who had overall responsibility for the Action summer in Evansville, said that weekly neighborhood ice cream parties the team hosted played a key role in drawing kids and allowing the team to meet their parents. The camp in Allendale, now in its 14th year, drew 111 children from the neighborhood, with 60 children coming on the camp’s busiest day. The Action team that ran the camp included Raquel Bradley, a 17-year-old who grew up in the neighborhood and has been coming to camp for seven years. Another neighbor, a recent high school graduate named James Porter, had attended the camp as a child. He returned as a volunteer, serving with one of the boys’ groups. Abcee Smith, the mother of a Praise Academy student who also attended the camp, volunteered in the kitchen, cooking for the Action team. Journee Elie, a graduate of Trinity School at Greenlawn who went to New Orleans for college and joined the branch there, came to Allendale to work with six-to-eight-year-old girls. She said that several sisters had urged her to work in Allendale, telling her that, as an African-American college student, she could be a particularly effective role model for neighborhood girls. “God has me here and I love it,” she said. 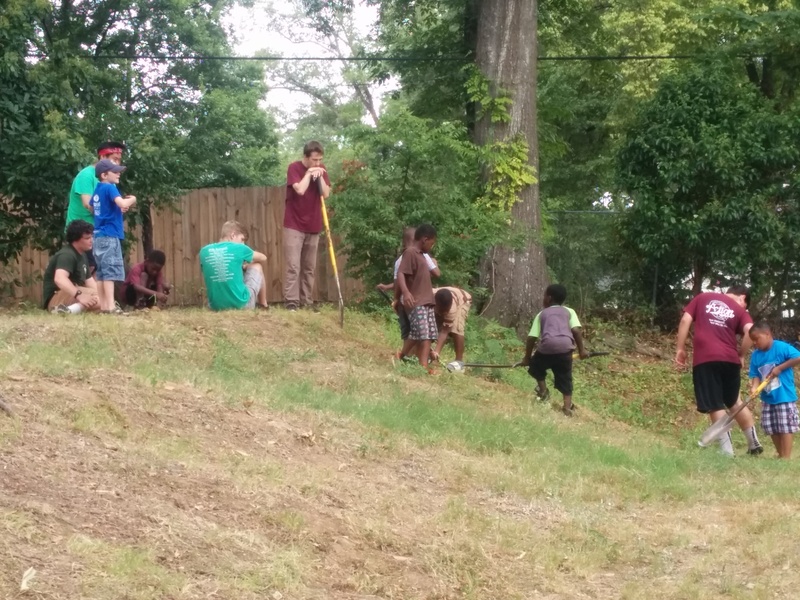 John Crimmins, a counselor from northern Virginia, recalled how during a Bible study, one of the older boys suggested that the group go to pray with and talk to their neighbors. John waited a few days to make sure the boys were serious about going. Then, on the last day of camp, they went out in two groups to knock on doors. “Everybody in my group led at least one conversation, even those who had initially been hesitant. My team prayed with six people,” John said. The five-week-long summer camp in Indianapolis drew 101 children. The boys enjoyed running timed races down Karcher Street, as well as playing capture the flag, kickball, basketball and football. The girls wove placemats, decorated journals and took a field trip to an art museum. Tim Pingel, who led the camp with Ellen Putzier, said that the counselors spent some time each day sharing Bible stories with the campers. “I hope that if the kids only remember one thing from camp, it will be these stories,” he said. Praise God for this outreach and thank you to all involved for your willing service. Wow! What an incredible job all these young women and men have done! Glory to God for his blessings on the camps and all who worked on them! Thank you all!! I have to admit one of my "favorite" parts of reading this was reflecting on the many volunteers in the article whom I have had the privilege to see grow up and now working to build the kingdom. Praise God for our life together and sharing it openly with the world around us. Congratulations on work done so well. What a difference you are making in the lives of these kids! You are doing the work of the Lord. Praise God for all of His great love shown through every camp! Hearing and reading these stories of how the Lord is working through Action is truly inspiring. I want to thank all the volunteers who have sacrificed for the sake of building His kingdom this summer. May the Lord bless you! 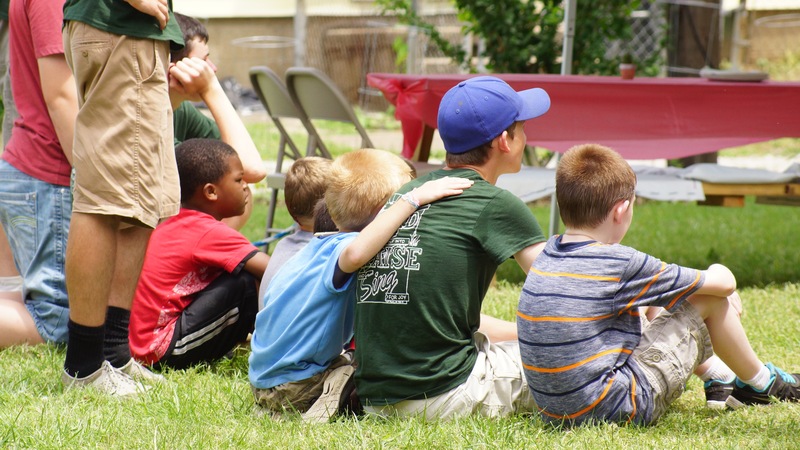 Helping children know Christ is one of the best things you can do. Yes! Praise God for the generosity of the volunteers & their witness! What a wonderful work! We are rejoicing! 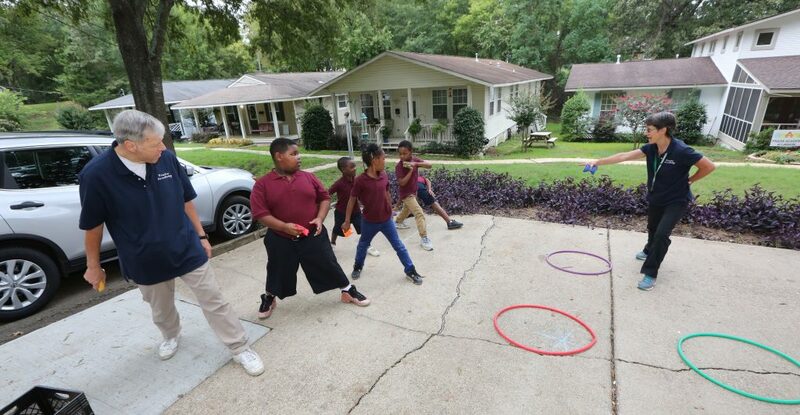 The work of the camp staff is a work of generous love to all the children in these neighborhoods. Through you they will come to know the generous love of our Father and believe they too are children of a loving Father. Praise God for the body and for inviting us into the harvest! Whether we are planting the seeds or cultivating the ground, or nourishing it with his word it is wonderful to hear of the bounty that we are seeing! Thank you to all who are serving! At our recent community meeting, the young people who worked at these camps shared many of their experiences. The glow on their faces and the sweetness of their sharings clearly revealed that Christ is at work building His kingdom and is using these young people in remarkable ways. Praise God. Congratulations to all you young and older workers in this wonderful effort! Along with all our schools, I cannot think of a more important work for our 45-year-old community to be doing. 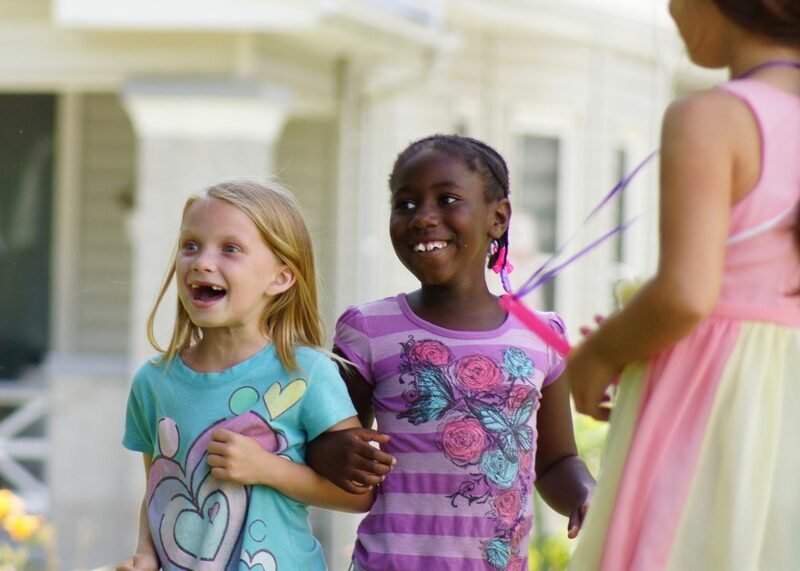 Our second- or third- generation children have initiated a work impacting the children of the world, the poor, the outcasts, in real ways, giving themselves to these children and this work for the Lord. It looks to have long-lasting effects, touching many lives in this world and for the next. Alleluia!!! Blessed are the pure of heart, for they shall see God. Thank you, thank you, guys! My heart was filled with joy as I read about the summer camps! Thank you, Jesus, for the brothers and sisters who served and for the children who had so much fun surrounded by your love. Dan and I are visiting in Evansville today. These wonderful missionaries have invited us to door knock this afternoon with follow-up questions for the parents of the kids who went to camp. We're so impressed with the humility and the overall thoroughness of the missionaries in all that they do here. We are also experiencing the Lord's beautiful peace that surrounds everything the missionaries do. Praise God! It is a joy to see that so many camps are doing such a great job of giving our youth an up close and personal experience of Jesus. I am so grateful to have been part of Servant Camp in People of Praise for the many many years of training our leaders and providing Jesus in the real. Praise God for the generosity and humility of staff and campers alike who participated in these summer camps of 2016. Thank God for those faithful who have interceded through this past year for the success of this beautiful outreach. May we all continue to say "yes" to the Lord's invitation to love. Thank you, Lord, for this opportunity to serve in the world in this capacity! Come Lord! Continue to use us!! With the spotlight on Black Lives Matter, it is a great joy to know that POP is doing something to make black individuals know that they matter to us and to make a difference in their lives.